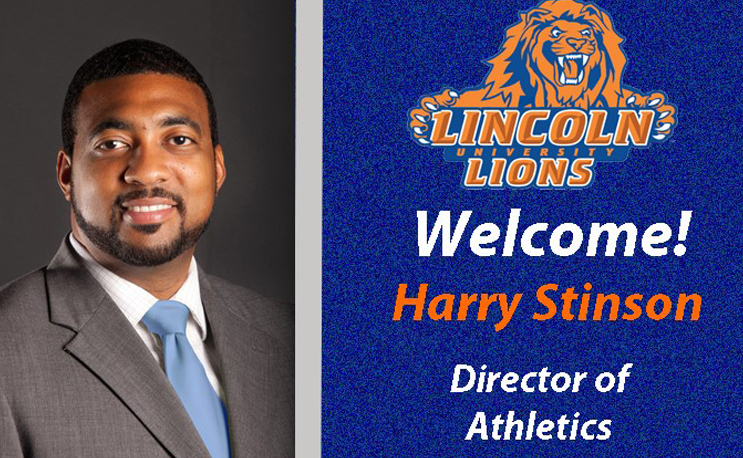 LINCOLN UNIVERSITY, Pa. – Lincoln University Interim President Richard Green announced today the hiring of Harry O. Stinson III as the institution’s athletics director. “He brings extensive administrative and academic experience to the position. We are looking forward to major growth and development to the Lincoln University program for student athletes,” Green said. Stinson replaces Anthony Plá who has served as the interim director of Athletics since September 2016. Plá will remain on staff as the Assistant Director of Athletics for facilities and Head Baseball Coach. Stinson comes to Lincoln with more than 12 years of experience as a professional administrator in collegiate athletics with expertise in university relations, strategic planning, external relations, development, compliance, event management, and business operations. At the collegiate level, he has served as head coach of the Kentucky State University golf team and interim coach of KSU Baseball. Stinson has served as associate director of athletics at Central State University in Wilberforce, Ohio, since October 2015, where he was responsible for the development and management of the athletic department’s $1.9 million operating budget and $650,000 in scholarship budget. In this role Harry also oversaw compliance, handled sport supervision for nine of CSU’s 10 sports, managed game day operations, and ran the day to day operations of the athletic department. Prior to Central State, Stinson served as the interim athletic director at Kentucky State University. In addition to his responsibilities as interim athletic director, Stinson also handled external operations and compliance for the athletic department as well as head men’s golf coach. Stinson was responsible for certifying student-athletes for competition, managing and monitoring all areas of athletics compliance and supervising all game day operations. He also served as the sport administrator for all 13 sports and oversaw athletic training and sports information during his tenure at KSU. Prior to his arrival at KSU in December 2009, Stinson served as the director of championships, communications and marketing at the Southern Intercollegiate Athletic Conference for nearly five years. He also served as Interim Commissioner during 2008-09. Stinson began his athletic career as a coach at Dr. Phillips High School in Orlando, Florida, coaching track and field, basketball and football. He also worked in Basketball Operations at the Amateur Athletic Union, as a League Administrator at the World Boxing League, and as director of Operations at the Georgia World Games Sports Commission. Stinson is a member of Omega Psi Phi Fraternity, Inc. and was a track and field student athlete at Florida State University where he earned a bachelor’s degree in human sciences in 2002 and a master’s degree in sport administration from Georgia State University in 2005. He also holds a professional certification in athlete development from the University of Pennsylvania. Stinson is also a graduate of several NCAA programming including the NCAA Pathways Program (2012) and the NCAA Leadership Institute for Ethnic Minority Males and Females (2009). He has one daughter, Laila. Stinson is a member of several NCAA committees including serving as the chairman of the NCAA Division II Committee on Infractions, serving on the NCAA Eligibility Center Advisory Board and the NCAA Golf Regional Advisory Committee. Stinson also is a member of many professional organizations including the National Association of Collegiate Directors of Athletics, National Association for Athletic Compliance Division II Committee, and Minority Opportunities Athletic Association Board of Directors.